German Chamomile Essential Oil is distilled from the flowering heads of the plant which releases a beautiful dark blue oil with a strong herb-like aroma. This highly versatile essential oil can be inhaled during a high pollen count, used to ease symptoms during the menopause, and is highly effective in massage to ease aching muscles and joints after a strenuous day. 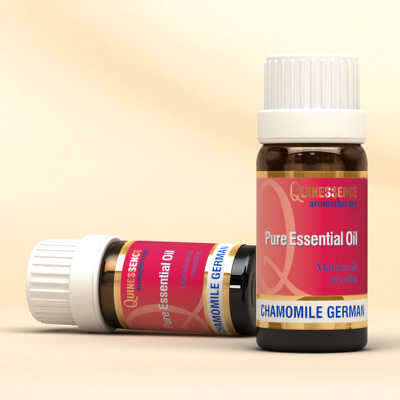 German Chamomile essential oil contains a constituent called chamazulene which is responsible for the dark blue colour and the pronounced soothing and anti-inflammatory properties. The anti-inflammatory properties of chamazulene and a-bisabolol which are natural compounds in German Chamomile Essential Oil have been investigated and authenticated extensively in research. As is so often seen though, these properties are more pronounced when both of these constituents appear together in the ‘whole essential oil’ rather than tested in isolation after separating them from the oil.